If you've been following along for any length of time, you might know I love all things French. In terms of furniture, for me this does not necessarily translate to a love of painting everything white. That's just me. I admire that look, but in the glaring sunlight of a Queensland Summer, I prefer something that echoes the cool of a rainforest. That means that here, we have soft Eucalypt grey-green walls, polished wood floors, and lots of antique and wooden furniture, most hand restored by me. The chest of drawers above, was given to me by my Mum, when I first moved out of home, 40 years ago. It was a bit of an ugly duckling back then. It had been stained a black sort of nothing colour, and the top was covered in psychedelic pink and brown contact paper. I painstakingly removed the sticky contact from the top, and then lovingly stripped the ugly black from it's gorgeous wooden bones, finishing it the old fashioned way with hand mixed shellac and a cloth. I can't remember how long it took me to get the depth of colour I wanted, but I do recall it was several coats of shellac. New brass handles were added to grace the front appropriately. And it has remained so ever since. Forty years later, it sits proudly in my dining room, housing my cutlery, placemats and candles, and various other niceties of a beautifully set table. 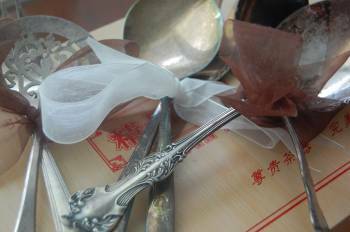 ...antique serving spoons, below, belonging to my Grandmother, also beribboned, just because I love the way they look nesting in the drawer like that, and pretty porcelain, reuseable placecards. We use many of these items every day. Why wait for special occasion? Isn't life meant to be special every day? There are so many memories wrapped up in my little dining dresser and it's contents. Engagements, Birthdays, Christenings, Christmas, evenings with friends and afternoon with family. Each placemat has been used to cushion a platter of delectables, each serving spoon has scooped a much loved family favourite onto a pretty dinner plate, each candle holder has held more than one twinkling light by which we've held the fine silk strands of family together. It's not about inanimate objects. It's all about the way those objects knit your family and loved ones like a cable. Dining at home becomes a Dining Experience, when we make the effort to serve it prettily. Anyone can slap a casserole down and spoon it out with a plastic spatula...and there's nothing wrong with that. But we eat with our eyes and our hearts and minds too. Each meal is an opportunity to create a memory. I know I'd rather my daughter have memories of Grandma's silver serving spoons, than a plastic spatula. Make tonight a Dining Experience at your place. Pretty china, cutlery and napery don't have to cost much to look effective. Thrift shops are a constant source of lovely things, discarded because life is too busy. Please.....don't be too busy, to create the memories of a meal served with loving care. It's worth it. Nice silverware with nice food is just NICE! Mimi I am still waiting to get back into unpacking the boxes (been way too hot and humid to even think about it) - I cannot wait for the pretties to be found - crystal from my 21st (one bowl I spotted on an on line homewares email and the bowl is now $500- to replace, if broken), Meakin 1950's dinner set and the list goes on. The cutlery is from the 1970's and has roses on it - could not resist. My best pieces are the sideboard - found in an oldwares shop for the princely sum of $250-. When the mission brown paint was removed the value escalated. The other piece is a crystal water set that belonged to a great uncle - never been used but it is going to. We use grandma's serving spoons too. I often wonder what she'd think about the Thai style green curry I made and served last night. Meals were all meat and 3 veg in her day. So pretty! 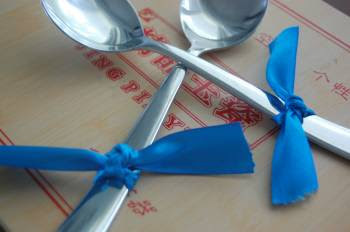 I love setting a pretty table too and I love the idea of adding ribbons to the spoons. Thanks for sharing! "Please.....don't be too busy, to create the memories of a meal served with loving care. It's worth it." Amen, my sweet friend! This was such a wonderful reminder and I so appreciate you sharing this lovely post with Roses of Inspiration. Much love to you! What a lovely vintage piece and it sure work perfectly for storage and the wood is wonderful! So glad you shared. You chest of drawers is beautiful especially considering all the trouble you went to get it looking that way. Your silverware is beautiful too!! Thanks for sharing!! Beautiful post. Love seeing your treasures! Those dishes at the end made my little tablescaper heart skip a bit! Thanks so much for joining the Dishing It & Digging It Link Party. I hope it brings you some wonderful traffic and new friends! First time visiting and I wholeheartedly agree. A nice tablecloth and napkins which match the china, pretty silverware, and a well presented homecooked meal go a long ways when it comes to bonding a family together. I live in a forest in Southern Appalachia (USA) and it is snowing as we speak. My china is British Castles Pink and the teapot is filled with ginger tea. Tonight we will dine on hot roasted vegetables and a roast pork with garlic and brown mustard. I've been inspired recently to begin setting a lovely table. I think there's a change in my future.